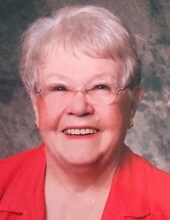 Janice Marie Carpenter, 84, died Thursday, March 21, 2019 at her son’s home in Florida after a short illness, surrounded by her loving family. A celebration of life will be held at 11 AM, Saturday, April 13, 2019 at Lensing Funeral Home, Iowa City. A private burial will follow at Aspen Grove Cemetery in Burlington, Iowa. In lieu of flowers, memorials may be directed to Iowa Public Radio or 350.org. Janice Marie Carpenter was born on March 19, 1935 in Russell, Iowa. She was the daughter of Everett and Zella M. (Sutton) Carpenter. Her family moved to West Burlington, and she attended and graduated from Burlington Schools. Janice was married to Floyd Wagoner, and she gave birth to their sons Bradley and Gregory. In 1963 they moved to Springfield, Illinois, and returned to Burlington in 1968. She was later married to Mervin Smith; they resided in Burlington, where she worked at Doeble Massner Peterson. In 1986, Janice moved to Iowa City, where she made her home for over 30 years. She worked for University of Iowa Hospitals and Clinics as an administrative assistant in the radiology department from 1988-1998. Janice traveled often with family and friends, notably to China, Turkey, Costa Rica, Alaska, Morocco, and much of Europe -- with favorite destinations of Italy, Ireland and Spain. She was an avid and discerning enthusiast of the arts, politics, and cultural events. She loved classical music and performances at Hancher, where she volunteered regularly. Janice loved to garden, and was involved with Project Green. She was active in 100 Grannies, a climate advocacy organization, and also volunteered at her church, Zion Lutheran. Janice rode RAGBRAI with Bradley and his family multiple times, and was very active in her granddaughters’ lives. Janice is survived by her dear sons, Bradley (Sue) Wagoner of Celebration, Florida, and Gregory (Rosa) Wagoner of Chicago, Illinois; her darling granddaughters, Erin (Kirk) Hansen of Moline, Illinois, and Stephanie (Daniel) Kimball of Washington, D.C.; and precious great-granddaughter, Zella Mae Kimball; Janice's sister-in-law, Bonnie Carpenter of Wilmington, Delaware; and Janice’s brother, Everett Larry (Gretel) Carpenter of Cincinnati, Ohio. Janice was preceded in death by her mother, Zella, and father, Everett, and by her brother, Edwin Duane Carpenter. To send flowers or a remembrance gift to the family of Janice Marie Carpenter, please visit our Tribute Store. "Email Address" would like to share the life celebration of Janice Marie Carpenter. Click on the "link" to go to share a favorite memory or leave a condolence message for the family.